VirSyn’s software vocoder Matrix has been updated to version 2.4. For Black Friday, some developers don't offer discounts - they offer plugins. Digital Brain Instruments announces the release of the second version of its Multiplex Vocoder standalone software for Mac and PC. 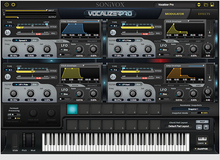 SONiVOX offers up to 50% discount off three of its virtual instruments until August 31st. For the third consecutive month, MeldaProduction offers a 50% discount off three plug-ins every three days. Matrix, VirSyn’s software vocoder, has been updated to version 2.3 and is available at a special price until the end of the month.